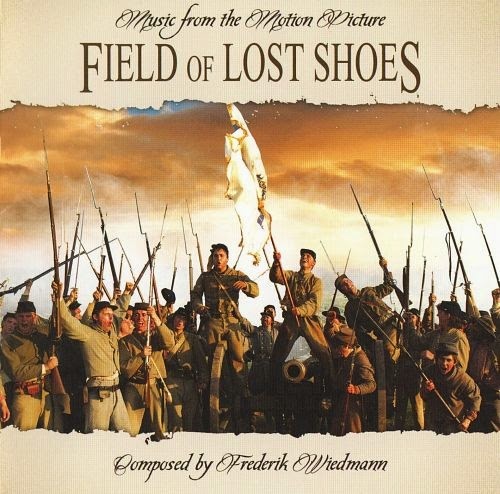 Right off the bat, you probably haven't heard of Frederik Weidmann and you probably haven't heard of the film, Field of Lost Shoes. Young and relatively fresh in Hollywood, Weidmann has done a bunch of direct-to-video releases as well as composed music for plenty of DC Comics animated films and television series. The film on the other hand is a retelling of the Confederate victory at the Battle of New Market, a 1864 Civil War battle which featured many cadets from the Virginia Military Institute. The album begins with the Main Title, a noble theme first introduced with chorus and violin solo before the orchestra comes in. The Issue of Slavery is string heavy and features a weighty sound, a peek at the dramatic tone heard later in the score. Young John Wise features a bluegrass folk sound, but really just capture the mood rather than authentic Civil War styles. The Initiation of a Rat includes a bit of suspense and action, before adding more folk elements. The string writing is reminiscent of Thomas Newman, with mixes of modern film writing. The Flower of His Youth goes back to the darker side, while building thematically to the finish. Sunstruck Rat mixes some unique sounds, the folk music element into a fast-paced cue. From an Artist’s Mind is a short and sweet string cue. Libby gives us the tender love theme, heard throughout the score. Old Men Make the Promises is a melancholic track, with a clarinet solo often taking the lead from the strings. The Recruited keeps the suspense with the pulsing electronic rhythm and low strings. Halfway through, we a sweeping moment, with chorus overlaying the miliary snare rhythms. It swells with the main theme, with a refrain to a solo fiddle and solo trumpet. Fans of Horner's Glory will no doubt see some comparisons in this track. Love at First Sight is that love theme, a gentle piano solo leading at the melody. Young Cadets Marching sets more of the film's locale with marching drums and trumpets before dissolving into a stirring string section. A Picture of the Past, while brief, gives a rendition of the main theme. The Conversation contains more of the love theme, with the strings keeping the melancholy tone. I Will Fight for My Family keeps the heroic tone under the surface, finally rising as the track ends. The Language of the Winners keeps the tension from before, with dissonance in the strings that always feel the need to resolve. The Helpless has the slightly exotic and eerie sound, building to a sweet and gentle piano and strings moment. Thoughts of War begins with a mournful-yet-optimistic trumpet solo. The fiddle leads the main theme in a quieter moment, before the chorus joins in. The string pattern and percussion adds an interesting quality to the end of the track. The overall cue may feel Horner or Kamen-esque, but the emotions are right on track. May 15, 1864 begins with the pulsing rhythm before leading to an action cue, not unlike 'modern' non-1800's scores. The main theme makes another rising appearance in New Market Heights. We get hints of the action side of the score, with the electronic pulse, percussion and chord progressions matching likes of Brian Tyler. Vadimus Miles contains both the sweeping style and action style heard earlier, utilizing the main theme in a grand reprise. Send the Boys In starts with the calm before the storm, the fast paced action music. There are sweeping and dissonant moments throughout, and doesn't always rely on the pounding percussion to keep the tension. The choral chanting add a great effect to the end. Storming the Hill is a great continuation of the action music, with some typical action string ostinatos. The ideas really get to expand in these longer tracks, clearly the culmination of the battle. The vocal solo is haunting, and the string passionate, and the militaristic style comes back in with booming percussion and the trumpet solo. Aftermath is a powerful elegy, without being too over the top. The track always balances on the sorrow and hopeful, with the end somewhere in between. A Soldier's Heart returns us to the love theme, with a trumpet solo and chorus coming to the front. Field of Lost Shoes starts with the eerie tune heard earlier. The haunting vocal solo returns, before transitioning to the main theme - which now has new found optimism. While it's impossible to compare, you can tell the seeped in influences of Thomas Newman, Michael Kamen, James Horner and John Barry. (He mentions Barry's Dances with Wolves as an introduction to film music). Able to write on a large epic canvas, Weidmann was able to flesh out a story though the music. Neither the action nor soulful drama seem forced. It's refreshing to see such a string-driven score, one that relies on melodies that help bring the emotional weight to the score. I had heard parts of his popular Green Lantern scores, and his range for this film really surprised me. I'm glad La-La Land Records released this score, which would otherwise not have been released at all. Weidmann's list of upcoming films continues to grow, and I'm sure we'll be seeing a lot of him in the future.